If you are the owner of a beautiful building site in a geologically challenging location, you should consider the use of micropiles before you build. 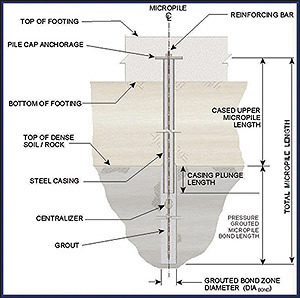 Micropiles are used when there are strata of solid rock interlaying softer material. In such cases, we drill a hole through all the layers using high-pressure hydraulics and pneumatics. Once drilled, we insert a reinforcing member, sort of like rebar, into the hole and then inject cement grout from the bottom up. The grout penetrates the softer soils, bonds to the harder ones and creates a friction "grip" that is simple to calculate and spectacularly effective. 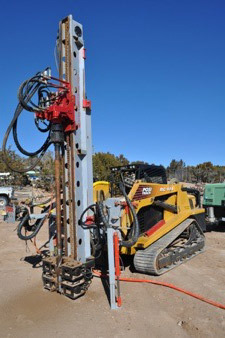 Micropiles on even the most difficult sites in Santa Fe will seldom exceed 20 feet in depth and can bear massive loads. As an example, a 4 7/8-inch diameter hole drilled to 15 feet with one high-tensile strength reinforcing rod grouted into the center can support up to 56,000 pounds. Yes, that's most of a house -- but you will need more than one because of the limits (the span strength) of the footings above. We have extensive experience with the installation of all types of underpinning and soil stabilization processes. In 1978 we installed the first grout curtain in Abiquiu Dam by drilling some 120 holes from the crown into bedrock, installing permanent down-hole tremmies and pumping well over 100,000 cubic feet of grout into the structure. Our first residential grouting job was in Santa Fe, in 1982, in which we successfully pumped grout bulbs under an adobe home with no footings. Subsequently, we built and employed grout injection equipment which we used until 1999 when we abandoned the technology in favor of helical piers. 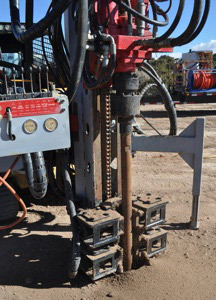 We have now re-entered the business of drilling and installing grout micropiles because the extreme geologic conditions, primarily on the east side of Santa Fe, dictate a process that will penetrate alternating layers of hard limestone and softer clays and shales. Our equipment cleanly drills slim holes, up to 6" diameter, to a depth of 300 feet -- a parameter we will never approach in this area. The average depth of a local micropile is 18 feet. The cost per pile can be as low as $500. Whether you are looking for a retrofit of an existing building, or a solid foundation for a new one, we are equipped and have the experience to exceed your expectations.